Viewpoint is looking for up 15 people from across the County to attend a Wellbeing Plan focus group on the afternoon March 20th 3 – 5pm at Colonnades in Hatfield, this is being organised by HPFT and the lead is Kate Linhart (Head of Social Work and Safeguarding). The focus group is being held to gain the views of service users on the Wellbeing Plan which is for people using Adult Mental In-patient and Community services, also those on CPA. The Wellbeing plan is not for people accessing Wellbeing team / IAPTS / CAMHS and people with dementia and learning disabilities as these groups use other specific care planning tools that are more appropriate. I have included a survey link below, for you to please complete. If you are interested in participating in the Wellbeing Plan focus group or would like more information please can you reply to info@hertsviewpoint.co.uk; or 01707-3861346 by no later than the Midday 15th March 2019. New Courses Added in December Due to Popular Demand! Adult social care and support matters to everyone in the country but decades of failures to find a sustainable solution to how to pay for services, and the Government’s recent decision to delay its long-awaited green paper on the issue until the autumn, has prompted council leaders to take action. The knock on effect of increased pressure on adult social care services – of which the spend for some councils accounts for over half of their core spending power– impacts on many of the services that keep our communities running in councils across the country. Today we am writing to let you know that we have launched a nationwide consultation to kick-start a desperately-needed debate on how to pay for adult social care and rescue the services caring for older and disabled people from collapse. Why are we undertaking a consultation? Adult social care provides personal and practical support to people of all ages help them live the lives they want to lead. It supports people who have disabilities, mental health conditions or are generally frail, as well as their carers. It helps bind our communities, it sustains our NHS and it provides essential economic value to our country. But social care is facing a crisis. It has been underfunded for many years and is facing a funding gap of £3.56 billion by 2024/25. Plugging this gap would just keep services standing still and does not include any funding needed to improve services. The longer-term remains just as insecure. It is time to come together and make case that investment in social care and support for people who need it helps them to reach their, and in turn our country’s, full potential. Why your views are important? We are all likely to be touched by social care at some point in our lives, whether that be ourselves or our friends and families. It’s therefore essential that everyone has a say in what the future of social care should look like and how we should pay for it. We want to start a nationwide debate about how best to fund the care we want in all our communities for adults of all ages - and how social care, the NHS and other public services can work together to support and improving people’s wellbeing. This is our chance to put social care right at the very heart of the Government’s thinking. We will reflect on what we’re told through our consultation in a further publication later in the autumn. Many of you have played a crucial role in helping us pull together this important piece of work, so thank you for all your contributions. We’d be very grateful if as many councils and stakeholders as possible could promote the green paper by sharing it on Twitter and elsewhere with the hashtag #FutureofASC. If you’d rather create your own content you can find resources, including suggested tweets and images, in our toolkit. Could you help us write a course about pain? New Leaf Wellbeing College is planning to write a course about living with pain. If you live, or have lived, with pain and have developed strategies to manage we would like to hear from you! We are looking for 2 students to join us at a co-production meeting on Wednesday 8th August at 2pm-5pm at Hertfordshire Partnership NHS Trust offices in St Albans. You can be reimbursed for your time if you wish. If you are able to commit to the co-production meeting please let us know. If more than 2 students nominate themselves we will draw names from a hat and notify the students drawn. New this term are Introduction to addictions & recovery, Self-compassion for everyday life, Five steps to wellbeing and Wellbeing & creativity. We look forward to seeing you next term! Free activities and prizes to be won – LAST CHANCE to register! 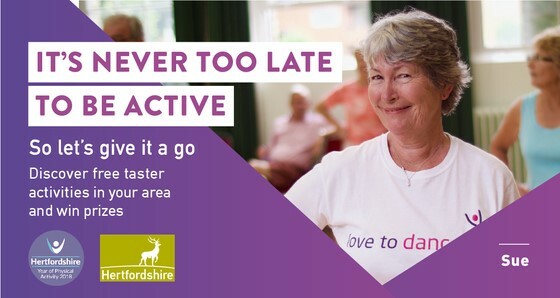 Visit www.hertfordshire.gov.uk/nevertoolate or call HertsHelp on 0300 123 4044 before 15 July 2018 to sign up. FREE activity pass (and free hot drink in some districts) for you and a friend to help you try new local activities. FREE guided walks across Hertfordshire every week for all levels and abilities. FREE activity planner to help you develop a regular routine and build up activity gradually. Complete a simple follow up survey to enter into a prize draw for an iPad, FitBit or clothing vouchers. Over 3000 sign ups so far! Read how one lucky local primary school won £1000 through the campaign. What’s your reason to sign up? “I want to take part in healthy activities but don't have the willpower and need a bit of a helping hand." You can also sign up to email updates on a variety of other topics on our website. Are you a student of the college? The college is looking for students to write for the New Leaf College Blog. You can share your recovery story and inspire others, give helpful tips on how you look after your wellbeing and/or talk about your involvement with the college. If writing isn't your thing, share your story via video instead! If you are interested in being involved in this fantastic opportunity get in touch via email! Physical activity keeps our body strong, mind sharp and gives us more energy to keep doing the things we love. But many of us don’t meet the recommended 150 minutes a week. 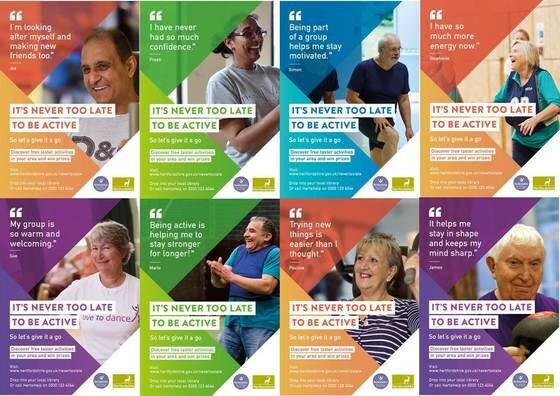 We want to help you become more active so we’re offering older residents a FREE local activity pass, plus the opportunity to win an iPad or Fitbit. We know it can be daunting to start something new, so our friendly HertsHelp advisers are on hand to help you find the right activity. Just call 0300 123 4044 or email info@hertshelp.net to get personalised advice. Any activity that lasts for 10 minutes or more counts towards your total.A short walk here, a spot of gardening there, a class or activity you enjoy, taking the stairs rather than the lift - it all adds up. Having a regular routine can help activity become part of your day-to-day life. Our free planner can help you build up your activity in a manageable way. There are activities to suit everyone, no matter what your budget, level of fitness or interests. Find out what's available for you. Regular activity could reduce your risk of dementia by 30%, heart disease by 35% and Type 2 diabetes by 40%. It can also help prevent and manage cancer and depression. What’s more, by signing up, you could win an iPad, a Fitbit or £100 voucher and help your local school win £1000 cash! In February’s meeting we will be focussing on how to get motivated with a talk from New Leaf College who provide a range of courses and workshops to help you to take better control of your wellbeing, learn some practical skills to build on your strengths. How do you cope with the emotions that come with finding yourself in a body that doesn’t do what it used to because of a sudden disability or a life changing diagnosis? Set your wellbeing learning goals with us in 2018! This year we expect a much worse flu season than last year, so people are being urged to get their flu jab. Staying free of flu is more important than ever. The vaccine is available every year on the NHS to help protect adults and children at risk of flu and its complications. Some groups are entitled to a free flu vaccine. New Leaf College provides a range of free of charge courses and workshops to enable you to take better control of your wellbeing, learn some practical skills and provides an opportunity for reflection on your own situation and how you can build on your strengths to achieve better wellbeing. Our courses are available to anyone aged over 18 living in Hertfordshire. Courses are offered from various campuses across the county. It’s #HertsOneYou week and inspirational residents from across Hertfordshire are sharing stories of their own personal fight back to a healthier lifestyle. By the time we reach our 40s and 50s many of us will have dramatically increased our chances of becoming ill later in life. Whether we are eating the wrong things, drinking more than we should, continuing to smoke despite everything we know, or just not being active enough, all of these small things can add up to an unhealthy you. Caroline Penn was diagnosed with Type 2 Diabetes a year ago. Read how she overcame her anxieties about taking up new activities and is now beating the condition with exercise. Find out how you can improve your health and happiness by visiting www.hertfordshire.gov.uk/healthinherts or completing a short health quiz. We are planning to launch a public engagement exercise to seek the views of local people on future spending plans. Our board have now agreed a set of proposals upon which to consult local people and we now have a firm date for the start of our consultation: Monday 3 July. We are running this programme alongside East and North Hertfordshire CCG (ENHCCG). It is called ’NHS let’s talk’. As a reminder: in recent months we have been exploring options for reducing our spending in response to growing financial pressures. There is a gap between the money coming in to pay for health and social care and what we need to spend in order to meet the needs of a growing, ageing population with more complex needs. This means that Herts Valleys CCG must make savings of around £45m in the coming year. Across the wider area covered by the STP (sustainability and transformation partnership) the financial shortfall, if we don’t take any action, is estimated at £550m over the coming four years. To tackle these challenges, we have been developing proposals to reduce spending overall. Wherever we can, we are trying to make changes in ways which won’t affect services. For example, we are: cutting administration costs; closely analysing all our lines of expenditure comparing our costs to those that other CCGs incur for similar things; and working with organisations that directly provide services to deliver best value for money. These measures won’t cover the whole deficit and so we need to look at what we spend on some services. Our focus will be on protecting funding for those services which have the biggest impact on the health of our population. Our proposals have been informed by a survey, carried out earlier this year, to ask residents what they thought our spending priorities should be. This showed that people think it’s important to prioritise treatments that deliver lasting health benefits and improve patients’ quality of life and to make the best use of local NHS resources. In line with this feedback and following detailed discussions with our lead GPs, we are considering changing access to some services, reviewing criteria for some treatments and doing what we can to help people to lead healthier lifestyles and take better care of themselves and families so that they rely less on the NHS. Doctors, who make up the majority of people on the CCG board, have been heavily involved in developing the proposals. This will help to ensure that good clinical practice is paramount in our considerations. We will be working with Healthwatch, patient groups, local community organisations and special interest groups to encourage as many people as possible to contribute their views. We are holding public events and drop-in sessions, attending community meetings and running an extensive social media campaign. The easiest way to find out more and give us your views is by completing the online questionnaires at www.healthierfuture.org.uk/nhsletstalk. The feedback we get will help inform our decision-making about these proposals. We look forward to your joining us in this important local debate. What is Between the Ears Project? Between the Ears Project aims to provide opportunities for people who are deaf, hard of hearing or experiencing hearing loss to meet and enjoy creative activities in a stress-free environment while also building confidence to pursue personal goals and be sign-posted for ongoing support for their condition. Come and meet new people in a friendly environment! Please click here to view the timetable for future (and past) events. Are you or any of your staff, colleagues, family or friends experiencing depression, anxiety, stress, low self esteem and confidence, addiction, relationship problems or any other difficulties in life? We can match you with a counsellor that can help with your specific problem, working through a range of therapeutic models. As members of the British Association of Counselling Practitioners and having much experience, we offer a professional, discreet and confidential service to our clients working to the highest standards in our profession. We can help you to grow as a person, relieve the symptoms of stress and anxiety amongst other things - really come along side you to make some sense of the problems you are experiencing and help you to move forward. We are offering a really competitive hourly rate of £25, based on weekly sessions to clients for the coming 12 months from 1st January 2017. Please contact us in confidence on 01992 537344, and book a free 15 minute consultation to discuss your needs and how we can help.